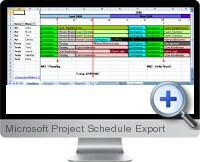 Microsoft Project Schedule Export for Excel is an add-in for Microsoft Project 2003 and higher to export easy-to-read schedule summaries in Excel format. The Excel based output can be used for executive presentations, resource leveling, sending to interested parties and seeing the entire project schedule at a glance. Find idle time in a schedule - usually created by dependencies or constraint dates. Visualize work flow and high level dependencies. Plan deliverables for each milestone. Communicate the plan to the project team, management and others that do not have Microsoft Project installed. Display the project schedule by day, week, or month. Export tasks and non-working time together. Assign task categories and custom category colors. Microsoft Windows XP, Microsoft Project 2003 (Standard or Professional), Microsoft Excel 2003.